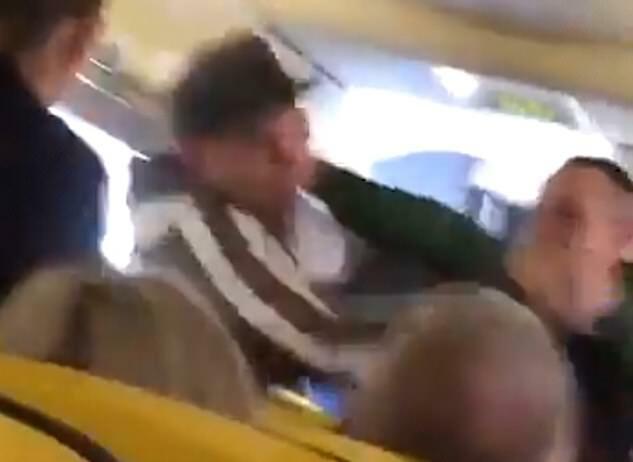 A Ryanair passenger had his 'nose bitten off' during a brutal mid-air fight which started 'over a woman not wearing her shoes', shocking footage shows. The airline said two men were detained by police after the brawl broke out on a UK flight from Glasgow Prestwick to Tenerife South on Saturday, leaving blood spattered across the cabin. Dramatic footage posted to social media captured the two men fighting as a female flight attendant attempted to step in and passengers screamed at them to stop. Ben Wardrop, who filmed the incident, said it stemmed from a woman not wearing her shoes and a fellow passenger taking issue with it. He explained: 'It all started over a woman not wearing her shoes on the flight going to the toilet, and a very drunk man pulled her up about it, saying that someone would stand on her toes, then the woman's boyfriend stepped in and tried to defuse the situation. The 30 second recording sees a man wearing a cap and hoodie and a younger gentleman in a black top grappling halfway down the plane. The man in the black top shouts 'that's what I got, that's what I got,' as he is pulled towards the front of the plane without any clear injuries. Another person was pushed towards the rear of the aircraft by cabin crew with blood dripping down his face. A witness said he was trying to break up the fight. Mr Wardrop said: 'One of the cabin crew, which was a young woman aged about 24, was caught in the middle of it all and was very scared, but done a good job on defusing the men fighting. 'There was a family with a young boy sitting in front of us that witnessed all of the action. 'It was a very scary moment as it was very confined and lots of innocent people got involved due to the small space on the plane. Ryanair's staff handled the situation very well,' he added. In the footage, a young boy peeks over the top of his seat to watch the fight, with more families and children reportedly on the plane. 'There were numerous occasions of drunk and disorderly behaviour leading to a man having his nose bitten off,' a source told the Scottish Sun. A Ryanair spokeswoman said: 'The crew of this flight from Glasgow Prestwick to Tenerife (16 Mar) requested police assistance upon arrival after two passengers became disruptive in-flight. 'The aircraft landed normally and police removed and detained two individuals. 'We will not tolerate unruly or disruptive behaviour at any time and the safety and comfort of our customers, crew and aircraft is our number one priority. It comes a month after a Ryanair flight from Glasgow Prestwick to Malaga had to be diverted after a 'full fist fight' reportedly broke out on board amid scenes of 'absolute chaos'. Witnesses said two men traded punches after a drunk male passenger had 'started pestering women in a hen party'. Cabin crew had to ask passengers for help as the violence unfolded in the aisle, the witness said. The plane, which had been heading from Glasgow Prestwick to the southern Spanish city of Malaga, was forced to divert to Madrid. A disruptive passenger was met by Spanish police in the country's capital before the jet carried on to its intended destination.